The bridal season is almost upon us again. The majority of our bespoke enquiries is about making wedding bands, our stockists are calling in pieces for their wedding displays and we’ve just had the first invite for a friend’s wedding this summer. Working on bespoke commissions is one of our favourite things to do. Over the last few years we have been making hundreds of engagement rings, wedding bands and eternity rings. Only one diamond in a million weighs a carat or more. Most diamonds are over three billion years old. Two-thirds the age of the Earth! Destination positivity, here we come! Our Rainbows & Unicorns collection is finished! It will whisk you away to a magical world of mystical creatures and sparkling gemstone rainbows Guaranteed to help you leave the doldrums behind and add style and sass to your look. Collaborate or go it alone - Is the commission a surprise for someone you love? You’ll need to decide whether to go it alone or to get them involved. How is January treating you so far? The excitement of Christmas and New Year is over, we’ve had Arctic cold, grey skies and rain. It’s dark when you wake up, it’s dark when you go home. If you’re anything like us, you might be feeling the teensiest bit blue. Christmas is approaching fast (as every year). 31 sleeps until you can rifle through your stocking and hopefully find something amazing. Obviously, we are thinking a little piece of jewellery would be just the thing. So, we've put together a few of our favourites for you to add to your own wish list or to give to that special someone. Are you the kind of person who lives for the Christmas shop? We saw you, wearing novelty antlers and tinsel, humming along to Mistletoe and Wine... Own up! Or are you, dare we say it, more of a Christmas grinch, who would much rather forget all about the festive season, give everyone vouchers and hide under the duvet until January? We've got some exciting news! After a whole year of waiting for a new addition to our Polar Nights brood, baby Jonty is finally here. Super cute and perfectly formed, he's the spitting image of proud parents Lara and Lars. Jonty is believed to be the smallest polar bear ever born, weighing in at an ickle 2.7 grams, but there is no stopping him from becoming the star of the "Jana Reinhardt Jewellery Minis". Summer's gone but you can still bask in the warm glow of our sapphire set sun ring! We've been enjoying the last days of summer this week with doors and windows wide open in our seaside studio, shorts and flip flops and Absolute 80's. We had the hottest September day in over 100 years a couple of days ago, but all of a sudden autumn came and I'm wrapped up in a blanket today, listening to the wind howling outside. So, we finally made our own letter charm necklaces. We have decided to go for handwritten lower case letter charms, similar to our logo. The letters can be dolled up with an even tinier charm. It's been ten exciting, challenging and rewarding years since I started making my own designs and building Jana Reinhardt Jewellery to where it is today. Giving up a well paid job as a diamond mounter in Hatton Garden (the heart of London's jewellery quarter) to start a jewellery company with no idea whether I'd make any money, seemed like a terrifying step to take at the beginning but I had worked as a goldsmith for ten years both in Germany and England and I was ready for a new challenge. If you were born in April your birthstone is a diamond, you lucky thing! Since we’re now in the month of spring and showers, here’s a little blog post about the monthly attributes of metastable allotropes of carbon... or, erm, diamonds. Ah February 14th, St Valentine's Day. Just two weeks to go until you get the perfect opportunity to show the one you love just how much you care. Or not, if some of the dodgy Valentine's Day gifts we've tracked down are anything to go by. The Jana Reinhardt seasonal shindig is happening tonight. There’s sure to be paper hats, rubbish jokes (from inside the crackers, not from us, honest) and a few drinks. As with any office party, we all wanted to look our best. So Lindy, Laura and Jana all wore their best Christmas jumpers, accessorised with their favourite pieces of Jana Reinhardt contemporary jewellery. Let it go. No, not the song from Frozen (although we guarantee there’s no escape from that this Christmas, or the next hundred). But as Elsa’s song suggests, it’s much better to agree to disagree. It's been a busy couple of months here at Jana Reinhardt. We’ve been hard at work creating and crafting the new Polar Nights winter collection, launched our brand new all-singing, all-dancing website and have just spent a fantastic week at the Spirit of Christmas Fair. Held at London’s Kensington Olympia, it’s the ultimate Christmas shopping destination for stylish and unique gifts. The perfect home for us! Arriving to find a less than inspiring blank space, with a bit of Jana Reinhardt magic and imagination, we’d soon transformed it into a beautiful boutique. 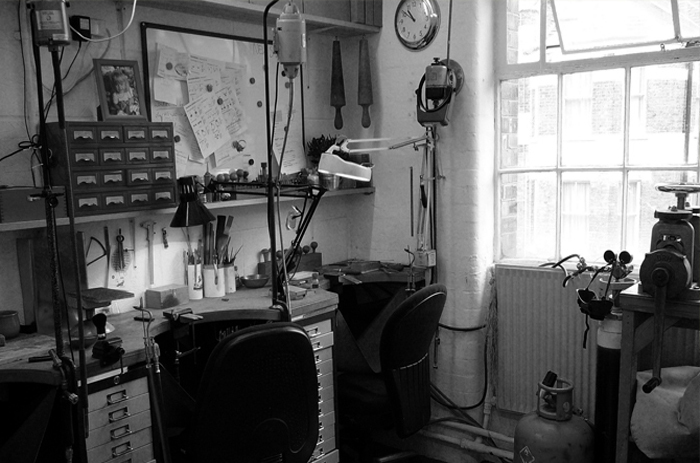 It was a very busy few weeks at the Jana Reinhardt studio leading up to IJL2015! With Hannah and Jana adding the finishing touches to the new collection and making new stock, Ross’s phone working overtime with all the calls and emails and as a team ticking off our to do lists and meticulously applying vinyl stickers for the exhibition stand. I am fairly new to the Jana Reinhardt team (marketing assistant), and was very excited to be a part of the trade show! It was not only my first time attending IJL but was also my first time at the spectacular venue – London Olympia. Making bespoke jewellery keeps us super busy here at Jana Reinhardt. People from across the globe ask us to make everything from pendants that look like their pet dog, to Grateful Dead cufflinks! We’ve created body armour for a pop group, a ring for a new TV series (more of which in the New Year) and a charm bracelet celebrating diversity that was exhibited at the V&A. Each bespoke piece is as different as the person who commissions it. We have moved workshop again and this time it looks like it might be the one! We are still at the Oaklands Business Centre in Worthing, but instead of a smallish old room at the back, we are now renting three big, bright and nicely decorated rooms at the front of the building. Forget about Wolf Hall, it’s all about new series: The Royals (showing on e! in March). Sacrilege! I hear you cry, why would they say such a thing? Well, perhaps because Jana Reinhardt made a key piece of jewellery for the show. Tune in on March 15th and the eagle-eyed among you will spot Ross and Jana’s handiwork twinkling on King Simon’s ring finger. We at Jana Reinhardt decided to mark the Chinese New Year by creating a very special limited edition sheep charm. Hi, I'm Lindy, the intern here at Jana Reinhardt - nice to meet you! Today I finished making a gorgeous gold commissioned piece and wanted to share a bit about the piece with you all. It’s been a really great experience and is a beautiful ring. I’m officially on maternity leave. Our little girl arrived a week ago, being everything we could have hoped for – healthy, sleepy and the perfect size for all the gorgeous little outfits we were given by friends and family. Whilst I am thoroughly enjoying cuddling up with her, I am finding it quite hard to forget about work and jewellery for a while. We just finished another exciting commission for one of our London customers. He’s a tailor with a great fashion sense and loves wearing his shirts with collar bars. Over the last couple of years, we made a scull bar and a bar with diamond set balls for him. We have just finished a gorgeous eternity ring, in 18ct white gold, set with 1.3ct of fair-trade Canadian diamonds. Fashion Bloggers Love Jana Reinhardt! For a while now we've been collaborating with some lovely ladies on their fabulous fashion blogs. It's been super fun looking through various blog posts, getting to know the bloggers, and seeing our jewellery styled and featured in some stunning photos. Spring has sprung, the sun is out, and here at Jana Reinhardt we’re getting all daisy-eyed over the floral offerings featured on the SS14 catwalk. We are exhibiting at the Spring Fair for the first time this year. Today is day four at the show and it has been quiet for a bit so I decided to write a quick post about the experience. Jana Reinhardt Shortlisted Finalist in UK Jewellery Awards! Retail Jeweller's prestigious UK Watch & Jewellery Awards is the number one award ceremony in the jewellery industry, running for over 20 years! Every year a team of top industry judges pick the cream of the jewellery crop for nomination in a variety of categories, with the winners to be announced at a super swish awards ceremony complete with champagne and celebrations - how exciting! Here are the designs for our S/S14 collection that we have been frantically working on. We are hoping to have some lines finished in time for the Jewellery & Watch Show at the NEC's Spring Fair starting Sunday! Our Tiny Sparrow Ring has been our best selling piece all year. It has featured in Grazia, Easy Living and will be in the January addition of Red magazine. We think it is a little beauty and we would like everyone to have one this Christmas! A few years ago Ross and I went to see the V&A’s jewellery collection. If you haven’t been yet, you should go and check it out. It’s astonishing! Over 3,000 jewels tell the story of jewellery in Europe from ancient times to the present day. There were quite a few pieces I fell in love with. One of them was a pair of gorgeous earrings made by Carlo Giuliano in the 19th century, pictured below. Much as we get immense satisfaction from making beautiful contemporary jewellery, there are so many stages in the process that are potential disaster areas, one wrong move and its back to the drawing board. This is why making jewellery, like any craft which involves a high degree of skill, experience and luck is so exciting. The wedding season is now upon us and if you’re looking for ideas for your outfit then why not take inspiration from some of the beautiful pieces available at www.janareinhardt.com. With their unique designs and delicate feminine detailing they make a perfect accessory to any stylish wedding guest outfit. 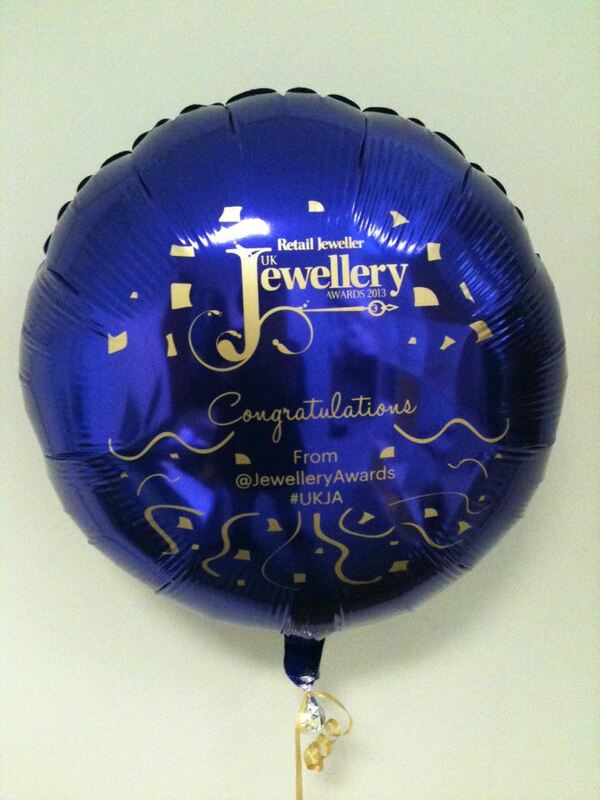 It’s been a great couple of weeks for Jana Reinhardt Jewellery, as well as releasing our new Spring / Summer Butterflies Collection, we had the amazing news (via balloon) that we are finalists at this years UK Jewellery Awards in the category of Etailer of the Year! Jana Reinhardt Jewellery is in Munich, exhibiting at Inhorgenta - Europe's biggest jewellery fair. We have a spot on the BJGI stand (British Jewellery and Giftware International), showing next to 13 other talented British jewellers. Our latest collection - Flight of Fancy - is finally finished. With this range we decided to take a step away from the delicate floral inspired pieces which have been our trademark. Bespoke bridal jewellery is all about expressing love and commitment in a unique, personalised way, tailored to your particular tastes and history. Many couples choose the bespoke route to celebrate their individual love story. Recently we were commissioned to make a vambrace. "Vambrace? ", I hear you ask. Its a piece of armour that was worn on the forearm to protect you from, well, loosing your forearm! We are currently working on a new collection which, I for one, am extremely excited about! Its a bird related collection this time, (a brave step away from our flower collections). Not sure what we'll call it yet, Year of the Bird perhaps!